After playing in the same Kit design for five years – six if you exclude the badge modification in 1977 – United were given a new, more modern look after they had become Scottish Premier Division Champions in 1983 and were to play in the following seasons European Cup. Made in a less shiny material than the previous top, a mixture of polyester and cotton, the tangerine Home shirt had occasional double horizontal lines running across the body, a simple black V neck collar, and three black Adidas stripes running from the collar down to the black cuffs on both sleeves. There was a major change with the Club badge on this new kit. The lion rampant shield, which had been introduced in the 1950s but was only ever used on match-day programmes and other similar merchandise, was finally worn on the team shirt, replacing the ever evolving DUFC emblem that had been on the shirts since the late 1950s. For the 1983/84 season, there was added text below the new badge, which read “Scottish Premier League Champions 1983”. The shorts and socks pretty much remained the same throughout all the strips supplied by Adidas. The black shorts had three tangerine stripes down each side, with the Adidas logo on the bottom left, and the tangerine socks were topped with three black stripes on the turnover. The new Adidas Home kit was first worn in the 4-0 victory over Motherwell at Tannadice in the opening game of the 1983/84 season, where the Championship flag was unfurled in front of the celebrating fans. It is remembered mostly for United's run in the 1983/84 European Cup, where they defeated Hamrun Spartans, Standard Liege and Rapid Vienna to reach the Semi Finals of the competition, where they were unlucky to lose to AS Roma. 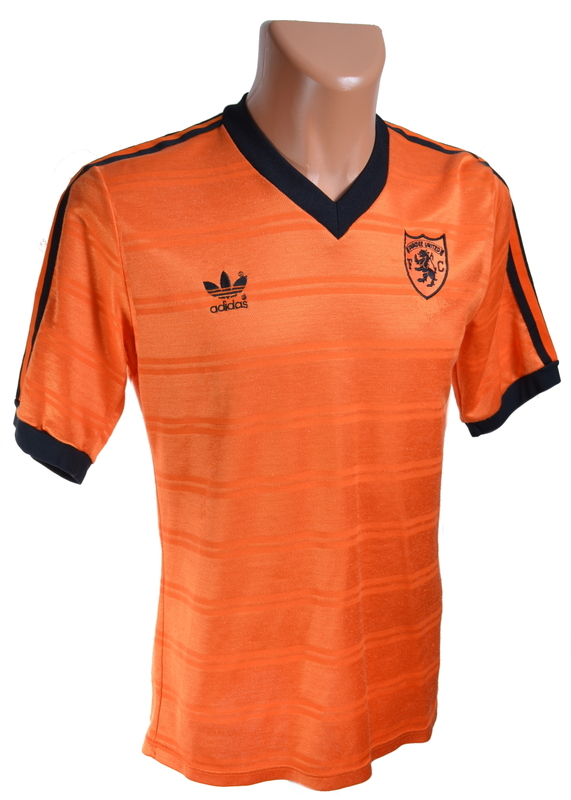 The kit was worn by United for two seasons, and was used when United faced Manchester United in the UEFA Cup at Tannadice in December 1984, with its last appearance being a 0-1 defeat to Dundee at Dens Park in the final League match of the 1984/85 season.